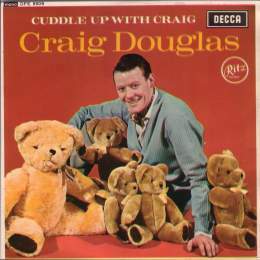 Craig Douglas was one of Britain's first 'Pop' singers. His achievement was really remarkable because he'd found a musical niche that appealed to teenagers and to their mums and dads too- sadly, it couldn't last. He was too lightweight to be considered rock and roll and yet nor was he a 1950s style crooner. He had still been a milkman when he got an opportunity to appear on TV's 'Six-5 Special' by winning a talent contest. Through this he secured a recording contract with Decca, but the two singles they issued were ignored. Luckily he was given a second chance by the new 'Top Rank' record label. His early songs were, almost without exception, covers of carefully selected material from American artists of the time. He was extremely successful, and even reached #1 with Sam Cooke's 'Only Sixteen' when the great man could only struggle to #23 with the original. On the EP featured on the right (DFE8509) we can hear Craig's interpretation of some well known Christmas numbers including Jingle Bells and even Rudolph The Red-Nosed Reindeer. It represented good value to Douglas fans on its release because you got almost fourteen minutes of seasonal music for a little less than twelve shillings (60p). I'm not sure where the Teddy Bears fitted in though. Craig Douglas' pleasant singing voice maintained its appeal until the onset of 'Merseybeat'. By this time he was singing more original songs, but had not sufficiently changed his 'sound' to gain new fans. He made one belated attempt at updating his style with 'Come Closer' in 1964 which he recorded with a group calling themselves 'The Tridents', but by early 1963 his chart career was over. However, Craig had by then built up a sufficient repertoire of material to fuel an act on the cabaret and nostalgia scene for many years to come. Top Rank JAR8033 1959 "Craig Sings For 'Roxy'"
Decca DFE8509 1962 "Cuddle Up With Craig"